MANILA, Philippines - The full list of topnotchers or top 10 passers for September 2017 Librarian board exam is available on this page as officially released on Monday, September 25, 2017 or in 2 working days after the exam. Apolonio Martinez Patron from University of Santo Tomas (UST) aced the board with 90.85%. It was followed by Sylvan Dan Macabante Moldes from University of the Philippines - Diliman (UPD) with 89.05%. 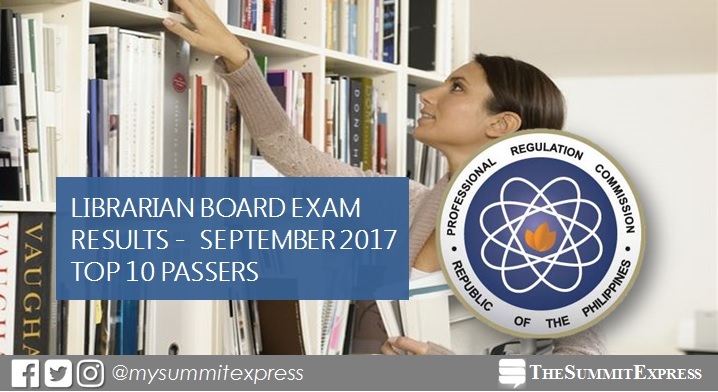 The Professional Regulation Commission (PRC) conducted the Librarian board exam on September 19 and 20 in the cities of Manila, Baguio, Cagayan de oro, Cebu, Davao, Iloilo, Legaspi, Tacloban and Tuguegarao. In the September 2016 exams, Karl Emmanuel Villanueva Ruiz from University of Santo Tomas (UST) topped the board with 89.90%. It was followed by April Mae Badilla Delola of Holy Cross of Davao College with 89.25%. In the April 2015 exams, Allana Sanglap Delgado from Central Philippine University (CPU) aced the board with 89.60%. University of San Carlos alum Seachel Sagmon Oyao placed second with 87.25%. Here's quick summary of topnotchers for Librarian licensure exam in the past two (4) years.